Tonight I received a text that a new Meijer mPerks digital coupon was available for a FREE Half Gallon of Meijer Milk. I just logged in, and sure enough it was there! 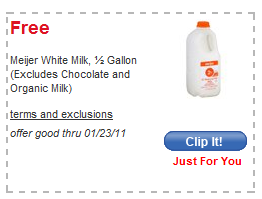 This coupon is valid through 1/23/11. UPDATE: Looks like this coupon is regional…see the comments for more info, or log in to your own account to see if you received something different. In addition to this coupon, there are 7 pages full of mPerks coupons! Sign up for mPerks here or sign in here. Learn more about Meijer mPerks here. Find a list of Meijer sale/coupon match ups for this week here. I just logged on to MPerks and I couldn’t find it… hmm. Didn’t have the milk coupon, but had a $2 off any purchase one. My husband had neither coupon. They sent me a text saying that I had a “just for you” coupon for $2 off my purchase. When I logged in this morning I had the $2, but not the free milk. Looks like it’s not the same for everyone. This must be a regional coupon since I just logged into Mperks and I don’t have this one. Although I did get a $5 off $5 or more and a $10 of a $100 or more. This would be a nice one to get as well! These must be regional, or user specific. I don’t have the free milk coupon, but I do have a $10/$100 that I clipped for my trip today. And have 8 pages of coupons – mostly Meijer nuts, though. I don’t need that many nuts! I got nothing but my husband got a free milk and my son got $2 or a $2 purchase. I’m in Central Ohio & did not get the milk coupon or any $$/order coupons…I do have 2 pages of Meijer nut coupons. That’s okay though, I’ve been doing more & more of my shopping at Kroger since they have a better coupon policy (& lately better produce) + better prices over all. It’s a little further out of my way but for less hassle over coupons & better customer service I’ll make the trip. I got $2 off (again) which was nice in Columbus OH. The last time they did this the coupon did not go through the register so I went to customer service and got $2 cash back. Then Meijer sent an email saying the issue was resolved with the original coupon and gave me another $2 off. I’ve found Kroger to be better value in the limited shopping I do, but I am tempted by the $2 off the PFChangs chinese (as this is really tasty meal) coupon – that will make a combined discount of $4 – not bad. My northcentral ohio coupon at mperks was for $10 off of $30, yay! Im in Westerville, OH and no milk, no $2 off either. This is the first time using mperks, used my daughter account since I do not have text so will see how this goes. very intereted.